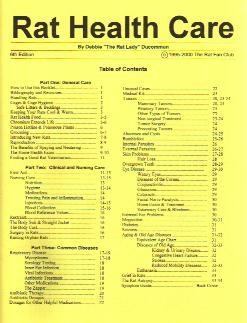 The Rat Fan Club publishes "Rat Health Care", a 50 page booklet written by club founder Debbie "The Rat Lady" Ducommun. "Rat Health Care" covers all aspects of rat health, from general care to the prevention, causes and treatments for common rat diseases. It includes a handy symptom guide that will help diagnose the probable cause of most symptoms, and flow charts to assist your vet with treatment of common illnesses. "Rat Health Care" is based on research, The Rat Lady's over 25 years of personal experience, and the experiences of numerous Rat Fan Club members. It is the most accurate, up to date and complete source of information on companion rat health care available. It is recommended for both rat owners and veterinarians. Part One - First Aid: First Aid Flowcharts, Medical Kit, Rat Facts at a Glance. Part Two - General Care: Finding a Good Veterinarian, Rat Anatomy, Rat Behavior, The Health Exam, Husbandry, Grooming for Health, The Benefits of Spaying & Neutering, Difficult Births and Runts, Raising Orphan Rats. Part Three - Clinical & Nursing Care: Nursing Care (Isolation, Warmth, Nutrition, Diarrhea & Constipation, Critical care Checklist, Medications, Injections & Rehydration, Treating Injuries and Pain, Blood Collection), Handling and Restraint, Normal Blood and Urine Values, Surgery in Rats, Antibiotics, Dosages for Other Medications. Part 4 - Common Diseases: Respiratory Disease, Congestive Heart Failure, Tumors, Abscesses and Cysts, Bumblefoot, Skin Problems and Hair Loss, External Parasites, Internal Parasites, Overgrown Teeth, Eye Problems, External Ear Problems, Seizures, Bloating & Megacolon, Diabetes, Urinary & Reproductive Disease, Aging and Old Age Diseases, Death and Euthanasia. Includes Flowcharts for Treating Lethargy, Sneezing and Wheezing or Laboured Breathing. We highly recommend this booklet, and if it saves you just one visit to the vet, it will pay for itself many times over. "Rat Health Care" is currently in it's 15th edition and is updated annually. Wholesale prices available to legitimate rat clubs or businesses for orders of 10 or more copies. Delivery times: 1 - 5 business days, depending on location. All local orders sent by Australia Post with tracking. Email Robyn with inquiries or your order details (or email me directly at robyn <at> dapper.com.au). I will send you a final quote for your order and details for payment. Please DO NOT send payment before submitting your order. Note: Orders cannot be sent until payment is received.